I'm so excited to introduce you to another one of my favorite makers! Meet Caroline Kolbe, owner and creator of Luella. 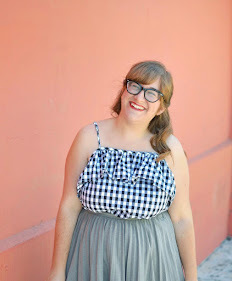 I first found Luella on Instagram when I started getting excited about all of the adorable pins I was seeing. One look at Luella's account, and I knew I needed to follow. Caroline uses her skill in graphic design and printmaking to create the cutest selection of joyful pins and T-shirts. Not only is Caroline a complete boss, her pieces are a celebration of all types of women and are guarantee to make you happy. Read our Q+A to learn more about Caroline and Luella and check the bottom of the post for your chance to win some pieces of your own! How and when did Luella start? Luella started over a year and a half ago as a vintage shop (which is how I came up with the name - originally Luella Vintage). I really love vintage clothes and decided to make that my part time thing for a while. I was taking a printmaking class at the time, so I started selling shirts and patches that I handprinted as well. My degree in graphic design lead me to designing enamel pins. At the end of last year I started to design enamel pins and released my first one in January! From there I designed more pins and started designing shirts too. How do you come up with the ideas for your pins and T-shirts? Everything I design for my shop are things that I would want to buy, but haven’t seen yet. I am an introvert who loves Dolly Parton, vintage, unicorns, summertime, and other cute things. My shop is very me and luckily other people relate/like it as well! I like that my shop has a positive/happy vibe and hopefully my products make people smile! Like many others I'm sure, I first came across your store on Instagram. How would you say the Instagram community and social media have influenced your business? I love how social media has connected me with so many other amazing makers and designers, as well as my customers! Nothing makes me happier than seeing a customer photo. Instagram has also really helped a lot in growing my business. It’s such a great platform for creative types! What are you favorite pieces in your store currently? Can I say everything?! Honestly, I love everything in my shop. 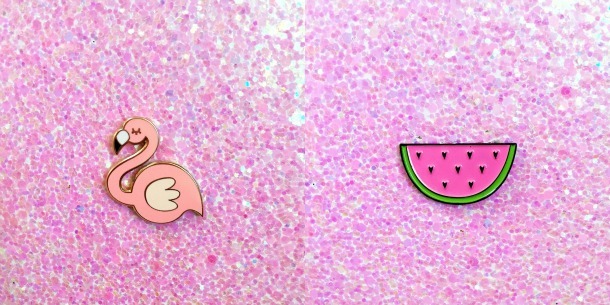 I'm obsessed with everything from my summer release - “Dolly Parton Vibes” and “Health Goth” tees and my pina colada pineapple, flamingo, and watermelon pins! I will always love my introvert girl gang shirt and introvert pin the most though. I feel like introverts get a bad rap sometimes, so I like to spread introvert self-love as much as possible! How would you describe the Luella customer? Whimsical dreamer with a little vintage flair. Pops champagne on special occasions. Is an introvert who isn’t afraid to stand out a little. Probably a fan of pink and maybe even glitter. Overall awesome girlboss, who isn’t afraid to take charge! Do you have any exciting plans or items coming up that people can look forward to? I just released my summer collection, so nothing new for a little while. I am traveling a lot this summer, so it’ll be nice to take a break from working on new products. I will release a new collection in the fall though. I have also been working on building my brand a lot over the past few months and I’m finally doing wholesale orders, so expect to see my stuff all over the world very soon! Caroline is being kind enough to offer you the chance to win Luella items of your own! 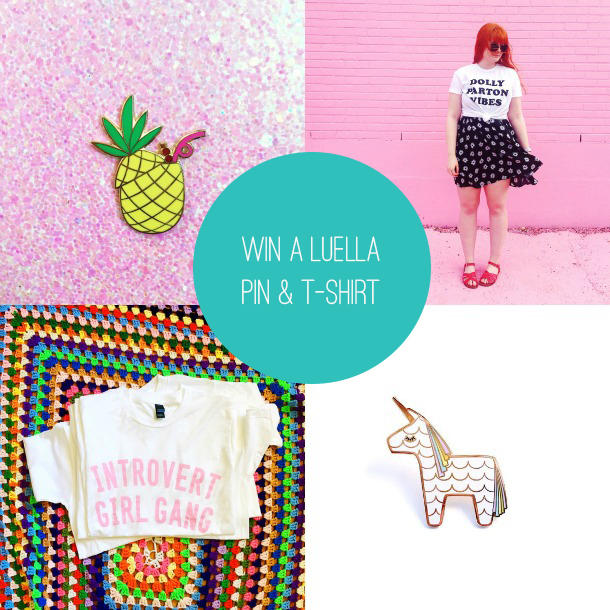 Enter below for your chance to win one pin and one T-shirt of your choice! This giveaway is open until midnight on 06/27 and is open to US residents only. The Unicorn Babe shirt is my favorite! Thank you for the wonderful giveaway. All the introvert stuff (T-shirt and pin) are so awesome! I like the questions in this interview too; felt it gave us insight into a fun brand! 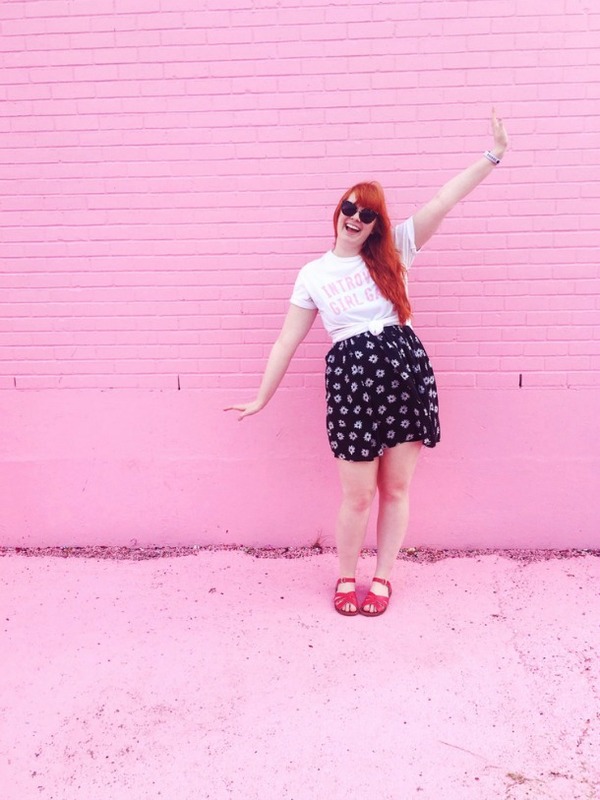 The introvert girl gang shirt is giving me life!!! I love the Unicorn Babe shirt and the flamingo pin! SO cute! Pineapple Pina Colda Pin in case anyone wonders what my favorite drink is I won't have to be so subtle. I would literally put each of those pins on anything I own, but the retro camper might be my favorite! Thanks for hosting!! 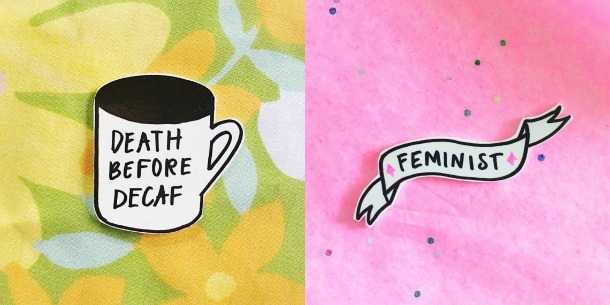 The Feminist pin and the Dolly Parton Vibes shirt are my faves. I like the Unicorn Babe shirt. The "Introvert Girl Gang" lol! Proud introvert since 1980. I like the Pineapple Pina Colda Pin. I think that the Death Before Decaf pin is absolutely adorable! I like the Happy Camper print....but seriously this shirt is the best! That's a gang I need to be in. 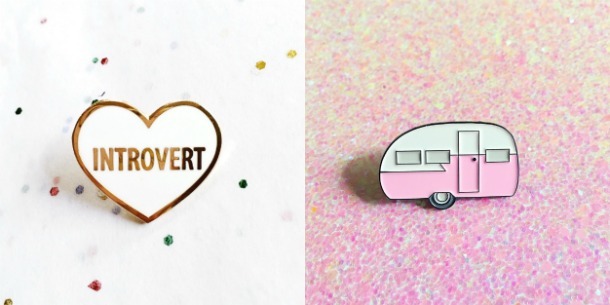 I love the introvert pin! It's been an adventure to be an introvert and a high school English teacher, but I love it!